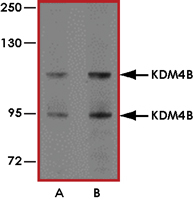 Sample Data :Western blot analysis of KDM4B in A20 cell lysate with KDM4B antibody at (A) 1 and (B) 2 ug/ml. Scientific Background :KDM4B or lysine (K)-specific demethylase 4B, which is also known as JMJD2B, contains a JmjN domain, a JmjC domain, a JD2H domain, 2 TUDOR domains, and a bipartite nuclear localization signal that overlaps the C-terminal part of the second TUDOR domain. KDM4B plays an essential role in human carcinogenesis through positive regulation of cyclin-dependent kinase 6 (1). KDM4B functions as a co-factor of estrogen receptor in breast cancer proliferation and mammary gland development (2). KDM4B is regulated by both ERalpha and HIF-1alpha, drives breast cancer cell proliferation in normoxia and hypoxia, and epigenetically regulates the expression of cell cycle genes such as CCND1, CCNA1, and WEE1. 1. Toyokawa G. et.al: The histone demethylase JMJD2B plays an essential role in human carcinogenesis through positive regulation of cyclin-dependent kinase 6. 2011 Dec.
2. Kawazu M. et.al: Histone demethylase JMJD2B functions as a co-factor of estrogen receptor in breast cancer proliferation and mammary gland development, 2011 Mar 18.